Changing attitudes and behaviour within an organisation is not easy. Employee engagement can be particularly challenging when trying to implement environmental initiatives. This is because environmental ideas are often championed by a lone voice in the organisation with very little senior management support and no budget. Sensible changes such as removing personal bins to promote better recycling practices or restricting local control of thermostats to ensure better efficiency and optimum comfort levels are misconstrued as unnecessary or disruptive to the business and met with resistance from staff. Even when practical steps are supported by staff such as switch off campaigns for lights and personal IT equipment; implementation and adoption rates are low because of poor habits. This is particularly relevant in an organisation where personal responsibility for the work environment is devolved. Technological solutions address many of these challenges by either automating a process (e.g. sensor lighting for automatic switch off) or enhancing control (e.g. advanced building management systems). However, technology comes with a cost which is sometimes beyond an organisations appetite for investment or not within a sensible payback timeframe. This article argues that effective engagement and communicative activities can provide similar benefits to technology without the added cost. People are resistant to change for many reasons which for illustrative purposes can be categorised into three areas. Firstly, a person may lack understanding of a topic and thereby quite naturally act cautiously or with scepticism when not in possession of all the facts. Secondly, this could be confounded by the issue of belief at both a personal or impersonal level which may act to undermine ones receptiveness to change regardless of one’s level of understanding or exposure to compelling facts. Finally, even when understanding is advanced and conviction in the merits of change expressed, one’s habits in maintaining the status quo reign supreme. For example, a person who smokes may want to stop smoking because of the facts presented on the health impacts associated with the pastime. Then again, a person who understands very clearly the health implications of smoking may be resistant to stop because at a personal level they don’t believe that smoking is going to impact their health. They may have witnessed their great aunty living to the ripe old age of 87 whilst smoking 30 a day. More often than not in this example, a person continues to smoke regardless of their understanding and belief in the health implications because they cannot kick the habit or addiction to nicotine. In fact, one’s responsiveness to change may be a combination of all of these factors – understanding, belief and habit. Similarly, the attitudes of staff in responding to the challenges posed by climate change within the context of the work environment can be illustrated by these factors. The general understanding of climate change within an organisation is likely to be mixed. Some people may be very well versed in the science of climate change and thereby recognise the impact of their daily actions. Then again, even informed individuals may not fundamentally believe that there actions have an impact on climate change. Finally, even when understanding and belief in climate change are aligned, people may continue to take actions which have a detrimental effect on the environment as they are in the habit of doing things in a certain way. 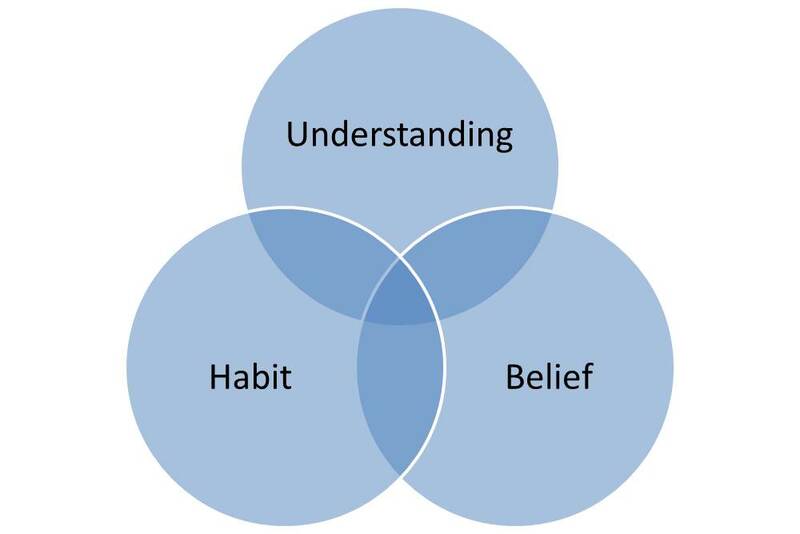 To engage employees on the issue of climate change an organisation should focus on applying the principles of the understanding, belief and habit model. Make sure that communications are written in straightforward language which engages people on a personal level. The best way to personalise communications is to localise and visualise the message. For example, when trying to get people to recycle, instead of rattling off the facts and figures about how much waste is produced in the world or in your country, spend a week collecting all the waste in your organisation and then display the waste in a very visual place. This will help people recognise the extent of their impact and provoke meaning for each individual on a very localised level. The best way to change people’s beliefs is to demonstrate the power of change. Following on from the recycling example above, a good way to get people to believe that they can have a positive impact on their work environment is to first show them the measure of their performance (i.e. each staff member currently produces two black bags of waste a week whilst at work – collectively this is equivalent to completely filling the volume of the office space with black bags once a year!). Secondly, demonstrate how making changes (i.e. recycling paper etc) could reduce the number of bags to 1 bag per staff member per week. Finally, publically provide feedback on people’s efforts to show the savings / improved performance that has been achieved as a result of their actions. Sometimes even when understanding and belief has been addressed, people continue to do things that go against their explicit convictions because they are in a bad habit. In the recycling example, people may be shocked and understand that they have a huge impact on the environment through their waste generation. They may be fully signed up to the idea of improving their performance as a result of the great management metrics that have been implemented to demonstrate their efforts. But they continue to have high waste volumes due to being in the habit of throwing all waste away next to their desk (i.e. via personal waste bins). Removing personal waste bins and centralising recycling can help break this habit by disrupting the status quo scenario of getting rid of waste. When thinking about engaging your staff on the issue of environmental improvement we would encourage you to go through the three step process of understanding, belief and habit to ensure you design the best engagement programmes which deliver great results!